Lean dough (it can be as yeasty and unleavened) can be prepared not only during lent, but at any other time. In its composition does not include eggs, milk, butter or margarine, making a lean dough is lower in calories and suitable for diet food. Pour yeast 50 ml of warm boiled water. Add for better response with 1 tsp of sugar and leave for 10-15 minutes. Sift the flour in a deep dish or pan, add salt, sugar and mix everything with a spoon. To the flour add yeast and water, pouring it gradually in small portions. 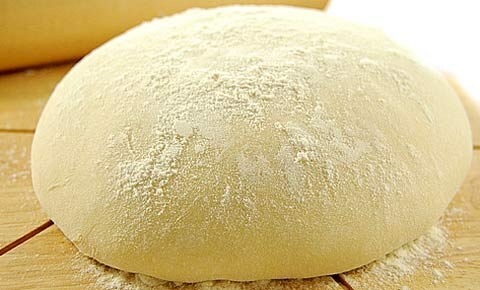 The dough should not be too thick or too thin. If you see that the dough is too thick, add a little water. When you feel that the spoon knead the dough becomes harder, continue to knead it by hand. Add vegetable oil in 1-2 reception. The dough should be elastic, it should not strongly stick to the hands and the walls of the vessels. Continue to knead the dough better on the table. From the dough form a ball, on top lightly sprinkle it with flour so the dough doesn't have obvestilo. Cover dish or pan with a towel and put in a warm place for 1-1,5 hours. Ebonite the risen dough, cover with a tea towel and leave to come approximately a further 1 hour. When the dough has risen the second time, it is possible to form products: open or close tarts, pies, muffins. Mix in a deep dish of warm boiled water, salt, sugar, vegetable oil. Gradually add in the sifted flour dish. Soda repay vinegar, add to the dough and mix well. Then you can knead the dough by hand. The consistency of the dough should be quite elastic, soft and not sticking to hands. Made from unleavened dough can be formed opening pies, after baking it resembles sand. If in the preparation of unleavened dough in a mixture of water, vegetable oil, salt and sugar add the cocoa and a teaspoon of spices of ground cloves, ginger, cinnamon and cardamom, and add less flour to the dough consistency reminiscent of sour cream, to make chocolate gingerbread.